Emma Lindblad pratar om jeans i 1:a numret av Habit International, s. 51-54. "Denim played a key role in the Swedish fashion identity that emerged in the Noughties. But where does this fascination for the blue fabric stem from? And what do jeans stand for on Sweden’s fashion scene today? 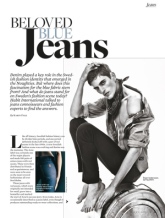 Habit International talked to jeans connoisseurs and fashion experts to find the answers."